Experience Christmas with Nore Valley Park! With a bespoke venue within The Courtyard at MacDonagh Junction Shopping Centre, and an immersive festive programme, this will be a Christmas to remember. We offer something for everybody. For those doing their Christmas Shopping on a schedule, come along to our drop-ins with Santa and his animals, lasting only 10-15 minutes (and FREE for adults!) or to make a truly memorable Christmas, come along to our Full Christmas Experience and cherish all that we have to offer. Our mischievous elves will welcome you inside and help the kids to write and post their letters to the North Pole before Mrs Claus invites the whole family into her magical festive kitchen to enjoy making and decorating Christmas cookies! Santa is waiting to meet all the good boys and girls in his stunning grotto. Take photos with jolly St Nick and receive a high-quality gift before visiting Santa’s deer in the stables. We also have a striking nativity display, with live animals to meet and to pet. To finish off your enchanting experience, the adults can enjoy complimentary teas or coffees at The Courtyard Bar & Grill. The Full Christmas Experience events run on Saturdays and Sundays between 1-6pm from 1 – 23 December 2018, tickets must be booked in advance (click here). Tickets start from €10 with family rates available. 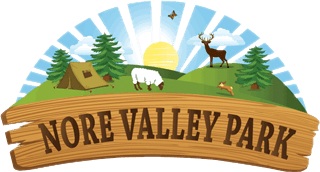 Call 056 772 7747 or email christmas@norevalleypark.com for any general inquiries and to discuss group bookings or corporate discounts. Drop-ins with Santa run on Thursdays-Sundays from 1-23 December and no tickets are booked in advance. Simply turn up between the specified times (Thursdays & Fridays between 2-6pm; Saturdays and Sundays between 12-6pm). Drop-ins with Santa cost €10 for one child, €18 for two children, €25 for three children and €32 for four children. Included is a meet & greet with Santa, a high-quality gift for each child and a photo with Santa before visiting the animals. Bring your pampered pooches and furry felines to Nore Valley Park’s Christmas Experience, within MacDonagh Junction Shopping Centre! Santa’s grotto doors are opening for all your four-legged friends, and with a special gift for every pet, he’s sure to set tails wagging! Families are charged €5 per pet to have a photo with Santa and receive a small gift. No booking is necessary and all proceeds from this one-off event will be donated to Samaritans, helping to save lives in Ireland. Our accessible and pet-friendly grotto will accommodate all but the largest household pets; if in any doubt please contact us! This event is a one-off, so don’t let Rover or Fluffy miss out! On 18th December between 2-5pm we are opening the doors of our Christmas Experience to provide an accessible event for children with Autism. Children can meet Santa in a safe and supported environment without the noise, crowds or the hustle and bustle you may otherwise find in our venue at MacDonagh Junction Shopping Centre. Places are limited, and in order to avoid crowds or queuing places at this special event may only be reserved by calling 056 772 7229 or by emailing christmas@norevalleypark.com.